One of our objectives was to demonstrate that our integrated analytical and structural approach to study glycan-protein interactions could be readily extended beyond the GAG system. Towards this we had begun our investigation of complex glycan receptors of influenza A virus as another exemplary system to extend our approach. During the course of our efforts we had the opportunity to investigate many aspects of the influenza A virus-glycan system, enabling us to extend our approach and tools development to address key questions. As a brief introduction, the viral surface glycoprotein hemagglutinin (HA) from avian influenza subtypes such as H5, H7, and H9 preferentially bind preferentially to α2-3-sialylated glycans (or avian receptors). On the other hand, HA from human influenza subtypes such as H1N1, H2N2 and H3N2, which have established efficient aerosol transmission and sustained circulation in humans preferentially bind to α2-6-sialylated glycans (or human receptors) on the apical surface of human upper respiratory tract. A change in binding specificity of HA from avian to human receptors is one of the key properties associated with the ability of a virus to efficiently infect and establish sustained circulation via aerosol transmission in the human host. The definition of HA-glycan interactions from the standpoint of terminal sialic acid linkage clearly does not account for the heterogeneity and structural diversity of this complex glycan mixture and presented an opportunity for employing our integrated approach to understand this important protein-glycan interaction. Using our integrated approach, we identified a characteristic glycan motif (which predominantly stood out among the diverse human receptors) of at least 4 saccharide units in length which was terminated by an α2-6 sialic acid (long α2-6 motif) . Furthermore, by analyzing HA-glycan co-crystal structures, we also developed a topological definition that captured the conformational plurality of the glycan receptors when bound to HA. We defined the topology of the long α2-6 motif as ‘umbrella-like’ spanning a large surface on glycan receptor-binding site (RBS) of HA. Conversely, avian receptors adopted a ‘cone-like’ topology, which span a narrower region on the RBS. To describe this difference, we defined a topological parameter θ as the angle formed by the anomeric centers of Neu5Ac, the penultimate Gal and the antepenultimate GlcNAc sugar. Finally, we showed that cone-like topology was characterized by θ angle > 110° while umbrella-like topology was characterized by θ angle <100°. To relate these structural findings with experimental measurements on binding properties, we developed assays to characterize specificity of these multivalent HA-glycan interactions at two levels: 1) quantitative relative binding affinity to defined human and avian receptors and 2) binding to physiological receptors displayed on human respiratory tissue surfaces (tropism). Through development of these assays, we were able to distinguish binding of human and avian virus HAs to human receptors and therefore address in part an important question in the field of why certain avian viruses infect human host and even show some human receptor binding but are not able to transmit efficiently via aerosol droplet in ferret animal models and humans (see [16, 17, 18, 19, 20, 21, 22]). Our approach was also quite timely in characterizing the glycan receptor binding property of the swine origin 2009 H1N1 pandemic influenza A virus (In collaboration with Terrence Tumpey, US CDC, Atlanta, GA) and correlate this property with its transmission in the ferret animal model and epidemiological transmission data available at that point of time [23, 24]. We further extended our analytical approach to characterize the diversity of sialylated glycan receptors in animal models for influenza such as ferrets [In collaboration with Dr. Jim Fox, MIT, ref:25] and chicken red blood cells  that are used to characterize viral titer. We demonstrated the abundance of long α2-6 motif in the cranial and submucosal glands of the hilar regions in ferrets. The pattern of distribution of the long α2-6 motif was consistent with binding of human viruses to the ferret respiratory tract that would permit their aerosolization for respiratory droplet transmission. We showed that chicken RBCs do not have the ‘long’ α2-6 motif and hence may not accurately characterize titers of some of the human viruses. We also demonstrated that, unlike aerosol transmission in ferrets, there is no direct correlation between glycan receptor binding and infection/virulence (collaboration with Dr. Subbarao at NIAID ). Given that much of our conformational analyses of glycan receptors stemmed from analysis of static HA-glycan X-ray crystal structures, we analyzed the dynamics of conformational sampling of unbound avian and human receptors in solution using NMR spectroscopy and molecular dynamics in collaboration with Ronzoni Institute, Milan, Italy . Through this effort we gained an appreciation of the value of using NMR spectroscopy to capture the nuances of conformational sampling due to glycan motion. We identified this as an important area to further expand our structure-function approach to define specificity in the context of a ‘dynamic’ glycan-protein engagement wherein the binding site of different proteins could potentially impose distinct constraints on topological sampling and impact specificity. We also embarked on development of new technologies to rapidly measure and functionally characterize viruses isolated from biological samples in terms of their relative binding affinity to avian and human receptors. One such technology involved constructing microspheres displaying avian or human receptors (streptavidin coated beads conjugated with biotinylated glycans) and analyzing their binding in a dose-dependent fashion to viruses through flow cytometry. We demonstrated proof-of-concept of this technology and distinguished several clinically isolated influenza strains on the basis of their relative affinity to human and avian receptors (see ). We have also focused our efforts on understanding the determinants for glycan-binding specificity on the HA and its RBS. Previous studies identified ‘hallmark’ residues that determine and distinguish binding of human virus HA and avian virus HA respectively to human and avian receptors. However, our analyses of multiple HA-glycan systems showed that hallmark residues alone could not distinguish receptor specificity and affinity. For example, although the 2009 H1N1 and 1918 H1N1 HA share high sequence identity and hallmark RBS residues, the human receptor-binding affinity of the former is substantially lower than the latter based on our measurements. A closer analysis of the residue contacts network of these HAs showed key differences in the network of specific residue positions in the RBS. In the case of 1918 HA, this network was hydrophobic, while in 2009 HA it was neither ionic nor hydrophobic. When we introduced a single amino acid change to make the network in 2009 HA ionic, it dramatically increased its human receptor binding affinity to be in the same range as that of the 1918 HA . We also extended our network analyses approach to show that glycosylation at a conserved sequon in H1N1 HA differentially affected human and avian receptor binding properties and provided a structural rationale for the effect of HA glycosylation on glycan receptor binding properties of HA (see [31, 32] for details). These analyses redefined the thinking regarding how features including network properties of RBS and going beyond hallmark amino acids impact HA-glycan interactions. As we analyzed the network properties of RBS of pandemic H1N1 HAs, we noticed that several residues that were part of antigenic site of HA were related to RBS residues via the residue contacts network. This relationship led us to determine a novel link in terms of how amino acid variations in the antigenic site (to escape host immune response) could impact changes to RBS residues related through contact network and thus impact glycan receptor binding (see  for details)). In collaboration with Dr. J. Yewdell at NIAID, we demonstrated that neutralizing antibody response to seasonal human H1N1 virus in mice introduced mutations in HA that increased binding avidity to glycan receptors while keeping intact the antigenic sites thereby resulting in escape from the initial immunological response. The propensity for these mutations was increased when the virus was transferred from naïve to vaccinated mice and vice versa (published in Science; see  for details). This observation provided a scientific rationale for vaccination: to restrict propagation of such escape mutations. With our understanding of the relationship between RBS residues, antigenic site, and glycosylation site on HA, we developed a new metric to define ‘antigenic intactness or identity’ (AI) between two HAs (see ). This AI metric goes beyond overall sequence identity of HA used in phylogenetic classification and vaccine selection strategies. In fact, AI between two HAs correlates well with experimental cross reactivity of antisera generated by viruses harboring these HAs. Recently, we had the opportunity to apply this unique understanding of the HA RBS to assess how natural sequence evolution of avian viruses such as H5 and H7, which threaten to adapt to the human host, impact glycan receptor binding properties of HA (published back-to-back in Cell [35, 36]). Key publications in 2012 in Nature and Science demonstrated that mutations in 2004 (A/Vietnam/1203/04 or Viet04) and 2005 (A/Indonesia/5/05 or Ind05) strains of H5N1 HA conferred respiratory droplet transmission. However, sequences of HA from currently circulating strains of H5 have diverged significantly from Viet04 and Indo05 HA. Introducing the same mutations in more recent H5N1 HAs did not lead to the characteristic human receptor binding properties of the human virus HAs clearly indicating it was necessary to investigate RBS in the context of the sequence evolution. The 4 key features are indicated. The residue contact network of representative positions are shown similar to Figure 5. To compare the H5 HA RBS with that of a human virus HA, we chose the phylogenetically closest pandemic H2 HA. By incorporating the glycan conformation and topology as well as using our network approach, we delineated 4 regions in the RBS that had different contacts and network properties between H5 and pandemic H2 HA (Figure 7). We identified these four RBS structural features and postulated that changes in the RBS of H5 HA that led to acquisition of one or more features of H2 HA RBS would move it closer to acquiring human receptor binding properties characteristic of pandemic H2. One of the features corresponded to a difference in the length of the loop that translated to deletion of an amino acid in H5 HA. We then analyzed the phylogenetic natural sequence evolution of H5 HA on the basis of these four structural features to assess if any currently circulating and evolving sequence clades has acquired the H2 RBS features. Based on these analyses we identified select strains in the rapidly evolving clade 2.2.1 and clade 7 H5 HAs that had already acquired at least two of the four H2 HA RBS features and demonstrated that as few as one or two mutations in these H5 HAs made them bind to human receptors in a manner characteristic of human virus HAs. During the course of our H5 studies, the sudden outbreak of a novel H7N9 strain among the human population in China [37, 38] spurred the immediate need to characterize this virus. 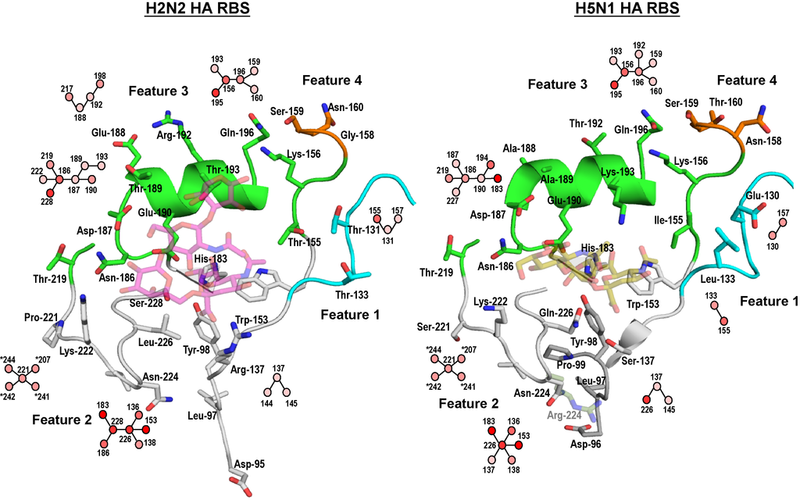 Through our integrated approach we showed that the H7N9 HA had a distinct binding property (both in terms of affinity and tropism) that was neither avian nor human HA-like. We demonstrated through our RBS features approach that introducing a single amino acid change dramatically increased human receptor binding and thus highlighted the need to monitor such changes in evolution of this new subtype.